Get outside and play, friends. Explore. Climb trees. Dig in the playground. Heck, dig in what’s left of those amazing gardens you created as a class. Learn about math by counting bugs and leaves. Science is all around you, just climb a tree and jump down to experience gravity. Books are best absorbed by being read under the shade of a large tree. Explore and create with all that nature provides. Give your darling teachers a bit of a breather. Teachers, we know you are exhausted. You have fought the good fight all year and our children are better citizens because of you. You deserve to celebrate the end of the year however your heart desires. We celebrate you each day in our homes, we are thankful for you in ways that we never knew was possible. Our kindergartners can add and subtract and are actually thrilled about it. (Maybe there is something to this new math business after all) Science class blows their minds and they know things about cells that we parents had long since forgotten. The other day, Wild Man came home all excited to tell me the names of the chicks that hatched in their classroom that day. Y’all, kindergarten teachers are hatching chicks in the classroom to teach kids about where their food comes from. Teachers, we love you. You are so creative. You have taught our darling ones to read. And oh can they read! They can read street signs and menus and books and billboards. Wild Man actually read the back of a sugar packet the other night at dinner. When I asked him why, he said, “because I can.” I mean, come on! How amazing is that? Teachers, librarians you have done well. These kids love to read anything and everything they can get their hands on. You did that. Teachers and coaches, you have taught our sweet ones how to manage their quickly-growing, uncoordinated little bodies. They now can actually shoot and make a basket, kick a soccer ball into a goal, defend an end zone and hit a tennis ball with a racket. Most important, you have taught them how to be a good teammate and a good sport. These lessons will carry them through their entire lives. They love the sweet yoga moves you have taught them and come home ready to show off the lion and tree pose. They use those breathing skills to calm down when they are upset. Physical education and movement teachers, we adore you. You are making such a difference. Language and computer teachers, thank you for teaching our kids new ways to communicate. Wild Man often comes home asking how to say different words in Spanish – not because he doesn’t know, but because he wants to know if I know. (For the record, I quickly redirect him to his father for those questions) His computer skills are far beyond anything I could have ever imagined and he loves the early reader games he plays in the computer lab. Thank you for opening their minds to other cultures and teaching them skills they will need the rest of their lives. Art teachers, oh, art teachers. We love you so. We don’t even care that every single one of his school shirts has some sort of paint stain on it. The fact that kindergarteners know who Van Gogh is and that he knows there is no failure in creation – only the opportunity to make something new, makes our heart burst. Wild Man loves to tell us about how everyone in his school is a superhero with a special superpower and how the art teacher is the only one who knows what everyone’s super power is. Thank you for keeping them excited about creating, imagining and exploring. You are a superhero. You are our superhero. 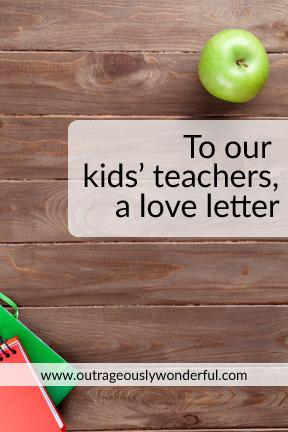 Dear teachers and administrators, we adore you. We came in at the beginning of the year not knowing what to expect and are moving on to first grade completely in love with you. So spend the next five days on the playground, in the library (we promise to return wayward books) and on field trips. You have earned every bit of joy that comes at the end of a school year. As for us, we will continue to thank God for your daily. We will pray for your life, your classrooms, your families. We will keep our rings in the pinch pots you helped them make and re-read the love notes you taught them to write. And when, in the blink of an eye, they are walking across that graduation stage, we will think of you. We will know that everything they achieve academically began with you. And we will thank you again. We love you. Thank you for loving our Wild Man as your own. Thank you for instilling in him a love of learning. We promise to do our best not to screw it up.